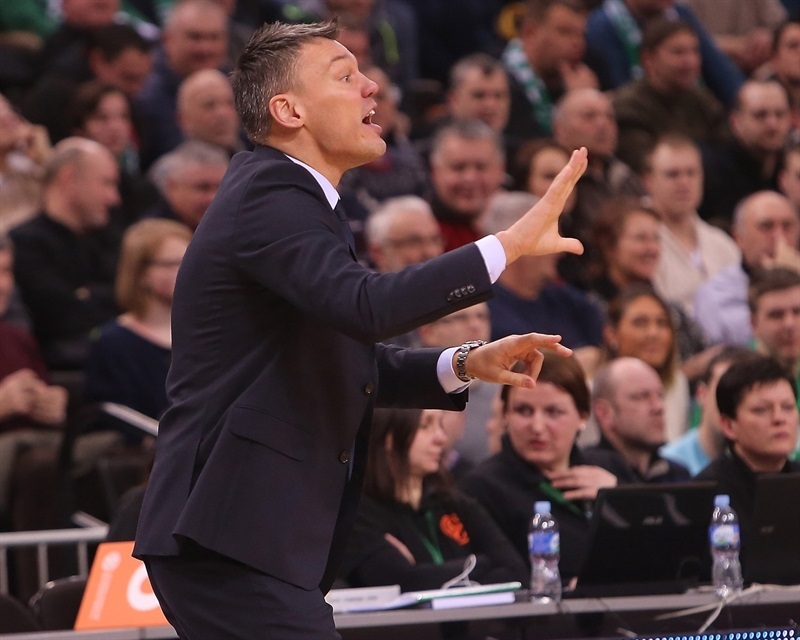 In the Euroleague home debut for Sarunas Jasikevicius as head coach, Zalgiris Kaunas put its defense on parade to down mighty Olympiacos Piraeus 75-55 and seize its first victory in Top 16 Group F. The 20-point margin was Zalgiris's biggest victory ever against the Reds, who matched their fourth-lowest point total in the Euroleague this century. 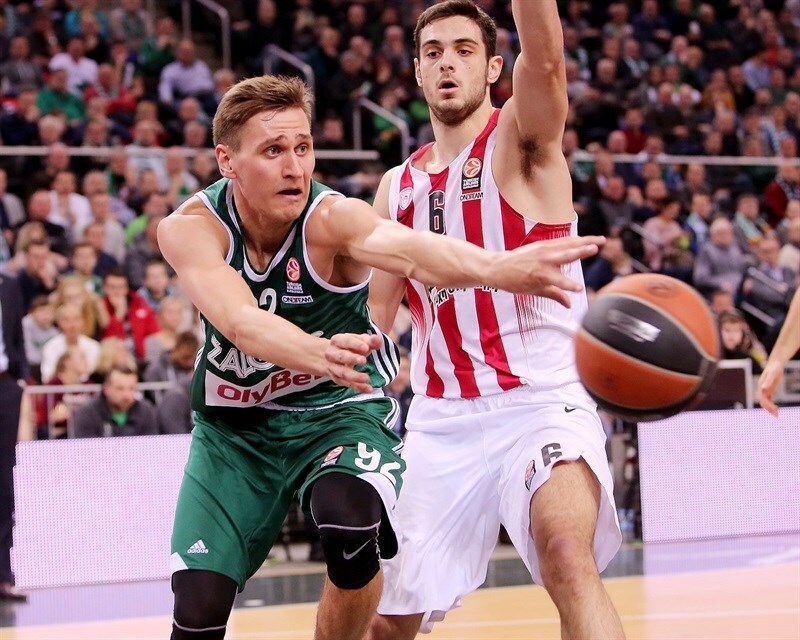 Zalgiris is now 1-3 in Group F and Olympiacos fell to 2-2 and a five-way tie for second place. 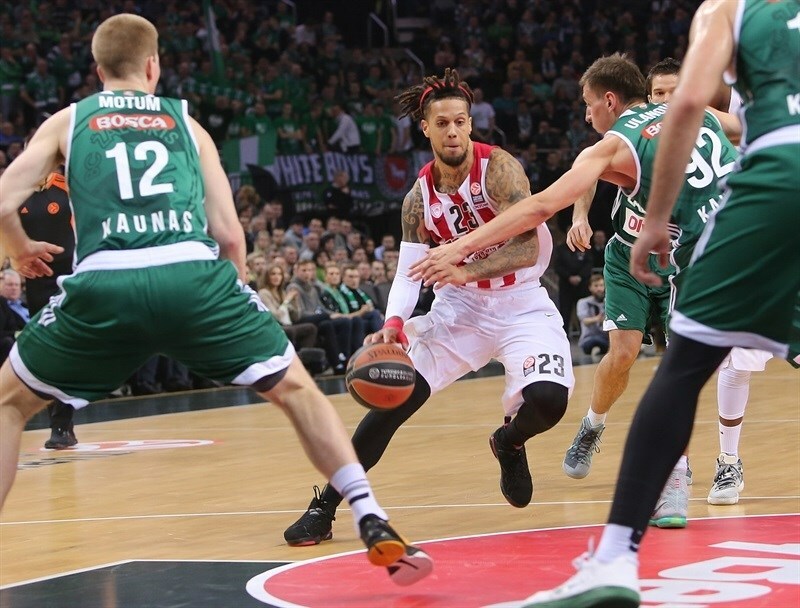 Zalgiris gave Olympiacos, the Euroleague's best defense this season, a taste of its own medicine by limiting the Reds to a single field goal for almost 15 minutes on either side of halftime then holding them scoreless for the first 5 minutes of the fourth quarter. Paulius Jankunas led the winners with 18 points. Ian Vougioukas followed with 13 points, while Renaldas Seibutis and Edgaras Ulanovas had 11 each. 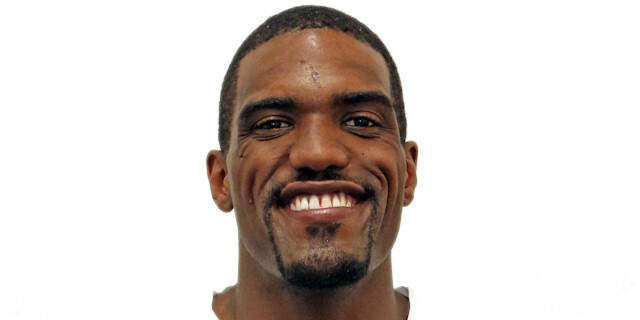 Olympiacos had just one double-digit scorer, Darius Johnson-Odom with 11 points in 11 minutes, while being held to 38% two-point and 20% three-point shooting. The Reds struggled at the free throw line through the first three quarters, too, impeding their comeback attempts. Conversely, Zalgiris went 21 for 22 on foul shots. 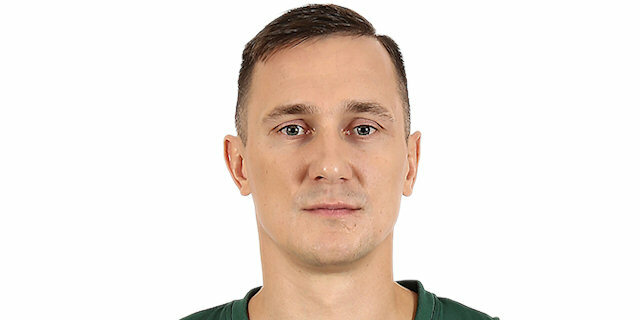 Lukas Lekavicius, making his first start of the season, got fouled on a three-pointer and downed all of his free throws for a 3-0 Zalgiris lead. Ioannis Papapetrou matched that with his team's first shot. Jankunas rolled in a hook shot before Siebutis, too, got and made 3 free throws for an 8-3 scoreboard. Vassilis Spanoulis threaded the needle to Georgios Printezis for a layup. 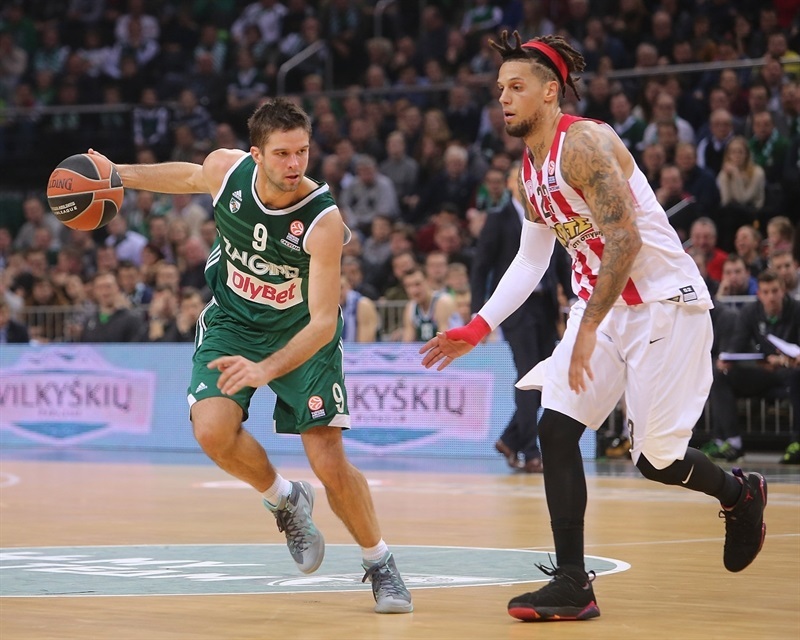 After Lekavicius made a one-hander in the lane, Printezis was back with a three-pointer, and when Nikola Milutinov put back a miss, Olympiacos had a 10-10 tie. After a timeout, Spanoulis did the honors of giving Olympiacos its first lead with a clean, foul-line jumper. 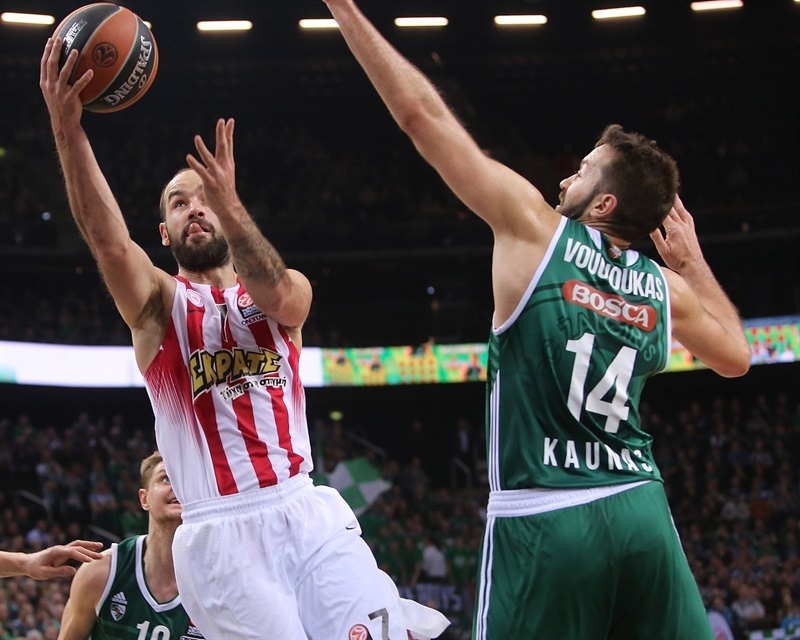 Jankunas evened the score with free throws, but Spanoulis drove strong to take back the lead. Ulanovas hit 1 of 2 at the line, as did Othello Hunter. And when Vougioukas tipped in his own miss, Hunter matched him at the other end with a spectacular dunk off an offensive rebound. Brock Motum's free throws evened the score again, but 1 of 2 from the line by Spanoulis put the visitors in front, 17-18, after 10 minutes. Daniel Hackett dropped an elbow jumper and Hunter a jump hook from the paint as Olympiacos upped its lead to start the second quarter. Vougioukas restarted the Zalgiris offense with a hook shot, but Hackett matched it with a fall-back jumper at 19-24. A lull then ended with Motum feeding Vougioukas for a dunk and the accompanying free throw to make it 22-24. Next, Martynas Pocius put his head down, drove baseline and tied the score. Then Ulanovas tipped a rebound to Jankunas who put Zalgiris back in front, 26-24. 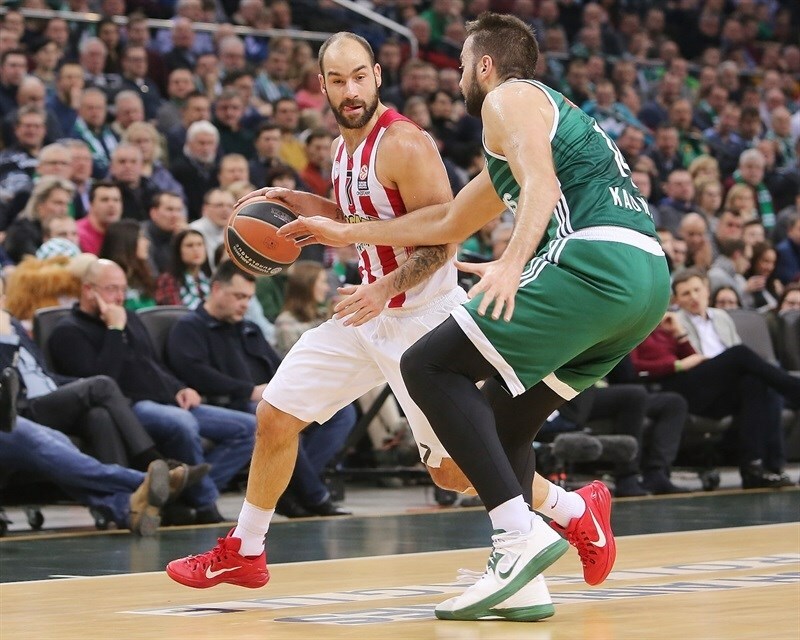 Olympiacos continued missing open shots until a free throw by Spanoulis ended a more than five-minute scoring drought, but Jankunas answered with a runaway dunk. When Printezis did the same, Ulanovas bettered him with a three-point play started by a tough hook shot as Zalgiris's lead moved to 31-27. Missed free throws by Hunter gave Zalgiris a final chance to extend the lead, and Pocius made that happen by feeding Motum for an easy layup. As such, the hosts stormed into halftime ahead by 33-27 after holding Olympiacos to just 3 free throws over the last 7:25 of the second quarter. Milutinov tipped in an Olympiacos miss to end his team's eight-minute stretch without a field goal. But Ulanovas responded from long range and Jankunas backed down for a fadeaway jumper and a 38-29 Zalgiris advantage. Lekavicius drove the lane, pivoted and banked in a layup for the first double-digit lead, 40-29, forcing an Olympiacos timeout. Hunter made 1 of 2 free throws but otherwise Olympiacos couldn't buy points as Spanoulis missed an open triple, making the visitors 2 for 15 from downtown until then. Hackett missed 1 of 2 free throws, as well, to make it 40-31. Ulanovas downed a pretty hook shot before Hunter flushed another miss. Motum scored on a feed from Vougioukas that turned into a three-point play at 45-33. 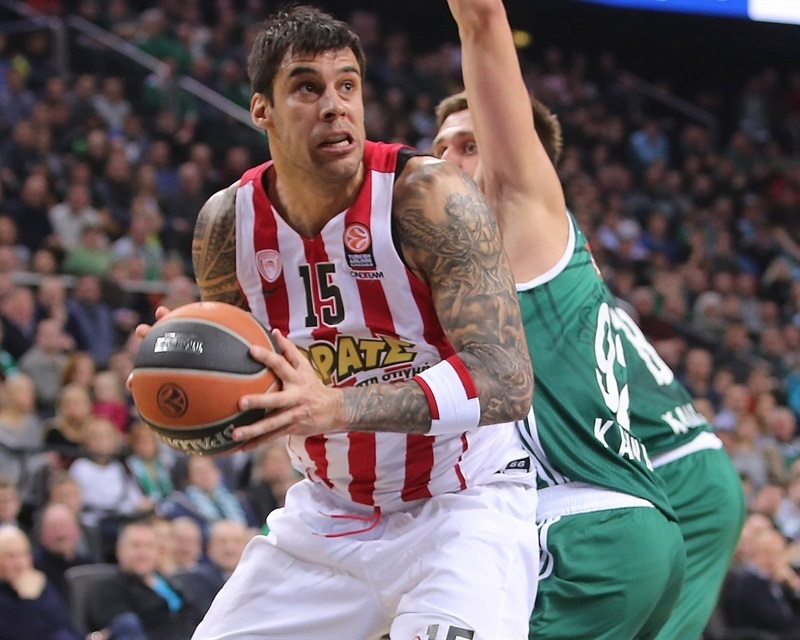 But after futility for much of the game until then, Olympiacos suddenly got a pair of three-pointers to fall from D.J. Strawberry and Vangelis Mantzaris. Vougioukas kept scoring with a couple inside baskets and Olympiacos kept splitting free throws, but was able to pull within 49-42. Motum made 2 of 2 for Zalgiris before Johnson-Odom kept Olympaicos strong from the arc. Olivier Hanlan then got his first points on free throws to finish the third quarter with Zalgiris holding onto a 53-45 edge. FOURTH QUARTER: Seibutis makes sure! Two scoreless minutes to open the fourth quarter were broken by Mantas Kalnietis, in his last game with Zalgiris, feeding Jankunas in a crowd for a layup and a new double-digit edge, 55-45. The Zalgiris defense continued to dominate as Jankunas hit from the baseline to make it 57-45, matching the game's high lead until then. But the hosts were not done. Seibutis took a pass from Jankunas and turned it into an acrobatic reverse-and-free throw at 60-45. Hackett got 2 points back at the foul line, ending his team's five-minute scoring drought, but Kalnietis hit a fall-down runner in the paint and Vougioukas downed a hook shot as the lead climbed to 64-47 with 3 minutes left. The best was yet to come for the Kaunas crowd, however, as Seibutis struck from the corner with a triple good for a 20-point advantage, 67-47. Seibutis would be back with a final turnaround swish in the final minute to give keep the Zalgiris fans on their feet all the way to the finish of a victory that will be remembered in Kaunas for a long, long time! "Of course, you don't expect things like this. But I think we had a plan and we executed it. In some places we got lucky, in some places we were good. That's the way it goes, you know. It's unbelievable. You always want to play in Zalgirio Arena with these fans. It's a great feeling and want to give big congratulations to our players and our fans. You never want to lose a true, true Zalgiris boy [Mantas Kalnietis], so it's very sad. But he has to move forward and we have to move forward." 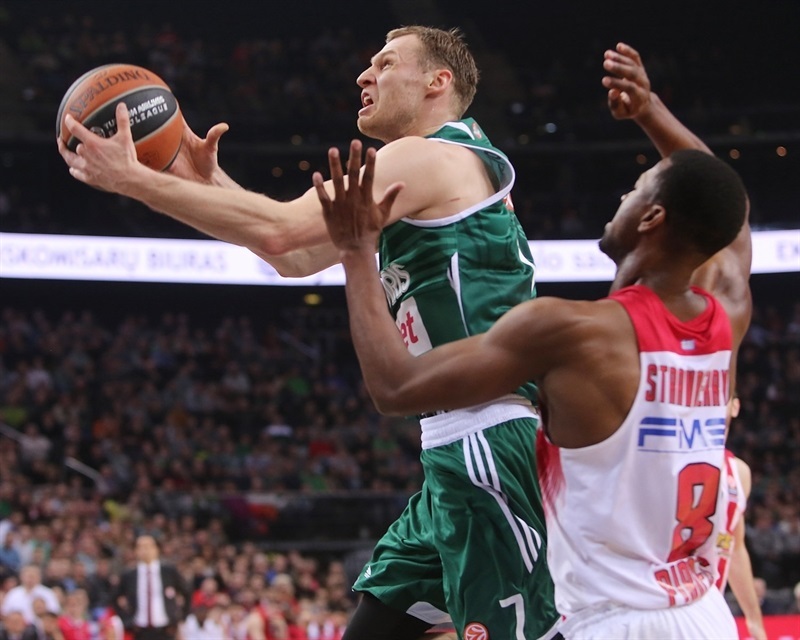 "I want to congratulate Zalgiris on the victory tonight. It was 100 percent deserved. They were much better than us in every aspect of the game. Our opponents were more hungry to win this game. We didn‘t show our real face, our game. We missed a lot of shots, because Zalgiris played a physical game and we couldn‘t respond to them. They scored easy baskets and found a way to victory. 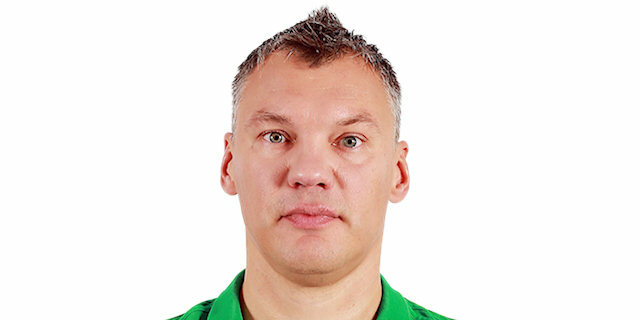 I wish Zalgiris the best of luck in the future." "It feels very good. It's our first win. We won at home. We're happy. But we're still not in our best shape. We have to work more in practice and play better. 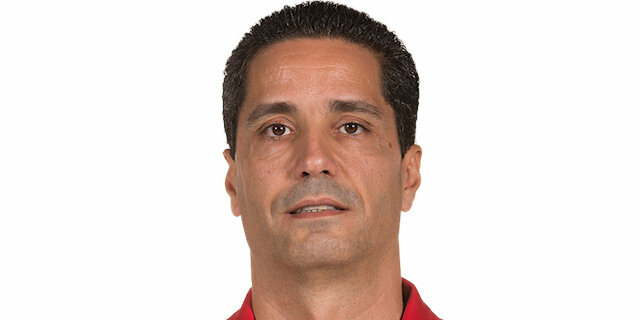 We knew Olympiacos would play hard so we prepared for that and we played good defense, I think. Saras changed pretty much everything starting from defense and finishing with offense." "We played against good team. They showed a lot of energy and a big effort. 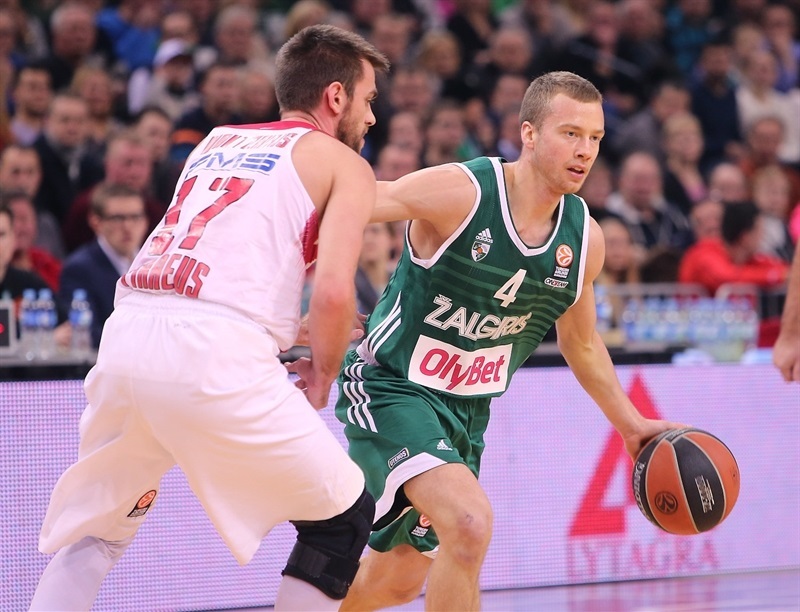 Zalgiris knows how to play this type of game and were prepared for that. They did everything it takes to grab the win tonight."